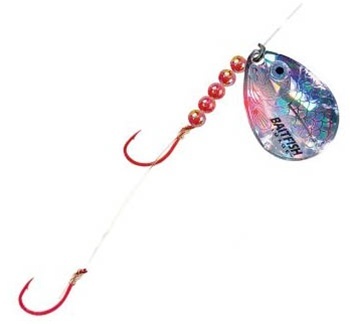 NNorthland Fishing Tackle’s Baitfish-Image Spinner Harness make the ultimate walleye spinner rigs, hand-tied with premium blood-red Matzuo Needle Point hooks and featuring lifelike 3-D holographic Baitfish-Image™ attractor blades for maximim flash and realistic reflection. 48'' leader of 14-lb. Trilene® XT, two #4 hooks and a #4 blade.